What, Art? You mean a meteor impact on Pluto threw up a cloud of frozen water, nitrogen and carbon monoxide that painted most of previously orange Charon grey, but left most of Pluto still orange? Much of the lightest material exceeded Pluto's surface escape velocity of 1.212 km/s. Much of the heavier material came crashing back down to produce Tombaugh Regio. <<Tombaugh Regio, nicknamed The Heart after its shape, is the largest bright surface feature of the dwarf planet Pluto. It is just north of the equator, to the northeast of Cthulhu Macula and to the northwest of Krun Macula, which are both dark features.Its western lobe, a 1000 km-wide plain of nitrogen and other ices, is named Sputnik Planitia. The eastern lobe consists of high-albedo uplands thought to be coated by nitrogen transported through the atmosphere from Sputnik Planitia, and then deposited as ice. Some of this nitrogen ice then returns to Sputnik Planitia via glacial flow. It is named after Clyde Tombaugh, the discoverer of Pluto. There is a region of Charon that is reddened, though I guess not as much as Pluto. Wikipedia has a fascinating comment about it. The reddish-brown cap of the north pole of Charon is composed of tholins; organic macromolecules that may be essential ingredients of life. These tholins were produced from methane, nitrogen and related gases released from the atmosphere of Pluto and transferred over 19,000 km (12,000 mi) to the orbiting moon. A later section of the article (see "Suface") talks about it more extensively. The region has been given the colorful name of "Mordor". So there is some red on Charon, and it is thought to have come from Pluto. One of the hypotheses about tholin formation is that it happens in the atmosphere more readily than on the ground. 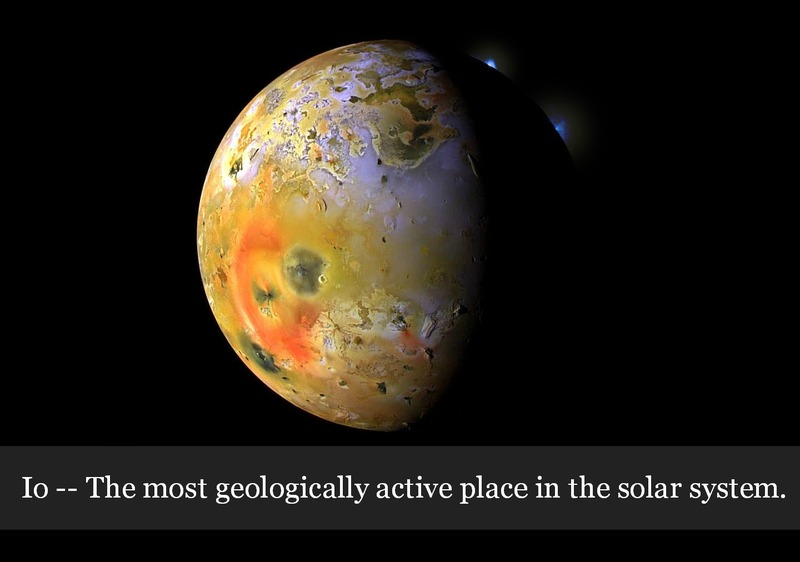 Pluto has an atmosphere. I would think Charon is too small to have any to speak of. The reddish-brown cap of the north pole of Charon is composed of tholins; organic macromolecules that may be essential ingredients of life. These tholins were produced from methane, nitrogen and related gases released from the atmosphere of Pluto and transferred over 19,000 km to the orbiting moon. So why is Ultima Thule reddish-brown? 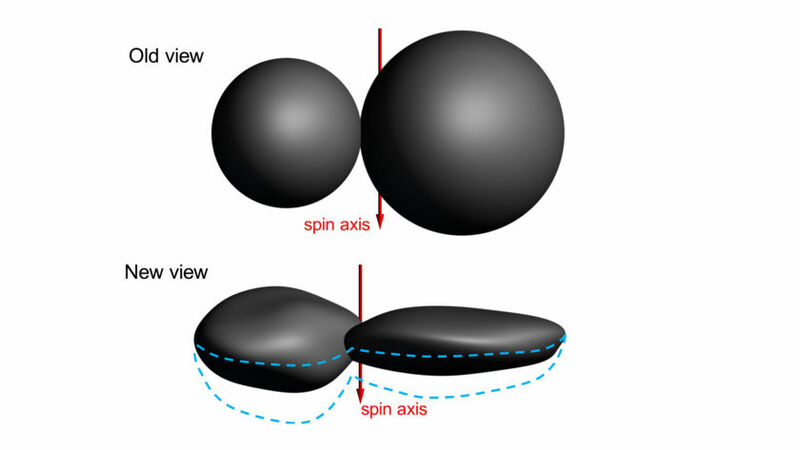 <<Scientists' understanding of Ultima Thule has changed as they review additional data. The "old view" in this illustration is based on images taken within a day of New Horizons' closest approach to the Kuiper Belt object on Jan. 1, 2019, suggesting that both of "Ultima" (the larger section, or lobe) and "Thule" (the smaller) were nearly perfect spheres just barely touching each other. But as more data were analyzed, including several highly evocative crescent images taken nearly 10 minutes after closest approach, a "new view" of the object's shape emerged. Ultima more closely resembles a "pancake," and Thule a "dented walnut." The bottom view is the team's current best shape model for Ultima Thule, but still carries some uncertainty as an entire region was essentially hidden from view, and not illuminated by the Sun, during the New Horizons flyby. The dashed blue lines span the uncertainty in that hemisphere, which shows that Ultima Thule could be either flatter than, or not as flat as, depicted in this figure. To me as a complete amateur, it sounds more reasonable that the orange stuff on the polar cap of Charon is a coating of material from Pluto, rather than the idea that entire grey surface of Charon (minus the red polar cap) would be a coating from Pluto. But I have to agree that there must be other means of forming orange tholins than atmospheric processes, since Ultima Thule is reddish-brown. Perhaps the collision between Ultima and Thule released materials that coated both bodies with some material that later turned reddish-brown due to ultraviolet radiation from the Sun? But aren't most old solid surfaces way out in the cold depths of our solar system covered in this "space-tar" aka tholins? This suggests that tholins form in space and very slowly settle down onto Kuiper belt objects, possibly in addition to forming on their surfaces. Also note that the whitest area of Ultima Thule is in the neck between the two lobes. This looks to be the youngest terrain on the body; a buildup of frost in the partly sheltered region between the lobes perhaps? The neck area would also be the least likely area to accumulate orange tholins raining onto the body from space I would guess. But aren't most old solid surfaces way out in the cold depths of our solar system covered in this "space-tar" aka tholins? This suggests that tholins form in space and very slowly settle down onto Kuiper belt objects, possibly in addition to forming on their surfaces. Also note that the whitest area of Ultima Thule is in the neck between the two lobes. This looks to be the youngest terrain on the body; a buildup of frost in the partly sheltered region between the lobes perhaps? The neck area would also be the least likely area to accumulate orange tholins raining onto the body from space I would guess. Dynamics of a rigid body in torque-free motion. is the penultimate example shown in this video. or twisting might cause friction heating at the neck. It is a great question, and these are some nice speculations about it. I don't have any more insight to offer. I wonder if Bruce's statement is correct: "aren't most old solid surfaces way out in the cold depths of our solar system covered in this 'space-tar' aka tholins?" I think spectroscopy being done on the objects of the Kuiper belt might indeed establish this, but I haven't seen anything that makes me think it is settled yet. A lot of evidence of signatures for water ice and methane are present, according to the citations I've found. I, too, used to think that most bodies in the outer solar system are reddish, but I don't think so any more. Charon is a case in point. iii)within the classical objects, the most spectrally red bodies (RR class) dominate the population at low orbital inclination, while blue objects (BB class) are more abundant at high orbital inclinations. These results confirm the previously suggested relationship between spectral behaviour and dynamical evolution, the red and blue colours being associated with the dynamically cold and hot populations, respectively. So this paper says that Trans-Neptunian Objects (TNOs)are not all the same color, and some are red while others are not. (I really hesitate to call any TNO blue). Clearly though, some TNOs are completely non-red, while others are really quite red. Those that are red are mostly found at low orbital inclination (which means that they orbit in the same plane as all the planets except Mercury and Pluto, right? ), while those that are found in high inclinations are often non-red. I still think that ultraviolet radiation from the Sun has something to do with coloring TNOs red. All in all though, this "sort of suggests" that Pluto and Charon could have different origins, and that Pluto may have captured Charon. Then again, I find it even more likely that Pluto has coated itself in orange-colored "tar" for some reason, while sending just a little of it over to Charon. Speaking of coatings, there are several bodies in the Solar System that have been coated in ways that have changed their appearance. Enceladus, moon of Saturn, with water ice jets. So Enceladus is coating itself in highly reflective fresh ice, while Io is coating itself in multicolored sulphuric deposits. The most interesting coated body in the Solar System is Iapetus. The difference in colouring between the two Iapetian hemispheres is striking. The leading hemisphere and sides are dark (albedo 0.03–0.05) with a slight reddish-brown coloring, while most of the trailing hemisphere and poles are bright (albedo 0.5–0.6, almost as bright as Europa). Thus, the apparent magnitude of the trailing hemisphere is around 10.2, whereas that of the leading hemisphere is around 11.9—beyond the capacity of the best telescopes in the 17th century. A better hypothesis is that the dark material is lag (residue) from the sublimation (evaporation) of water ice on the surface of Iapetus, possibly darkened further upon exposure to sunlight. Because of its slow rotation of 79 days (equal to its revolution and the longest in the Saturnian system), Iapetus would have had the warmest daytime surface temperature and coldest nighttime temperature in the Saturnian system even before the development of the color contrast; near the equator, heat absorption by the dark material results in a daytime temperatures of 129 K in the dark Cassini Regio compared to 113 K in the bright regions. The difference in temperature means that ice preferentially sublimates from Cassini Regio, and deposits in the bright areas and especially at the even colder poles. However, a separate process of color segregation would be required to get the thermal feedback started. The initial dark material is thought to have been debris blasted by meteors off small outer moons in retrograde orbits and swept up by the leading hemisphere of Iapetus. Thanks, Ann, for some fascinating info.